Yesterday’s account of aspiration and VOT only covered initial consonants and initial consonant clusters: more precisely, those at the beginning of a stressed syllable. It covered the English aspiration of [p] in words such as page, pick, appear, spin, price, pure, display, of [t] in words such as time, top, attack, stand, tree, and of [k] in words such as coffee, key, account, scanner, cross, clean, accuse. But what about [p t k] in other positions? In those positions that I (but not everyone) would consider syllable-final? It is unfortunately the case that English aspiration is not a matter of all or nothing. In some positions voiceless plosives may have a certain amount of aspiration, but not enough to call them fully aspirated. The VOT in such cases is intermediate between that of “aspirated” voiceless plosives and that of “unaspirated” ones. • when they occur at the beginning of a syllable in which the vowel is strong. • if immediately followed by another plosive as with the k in doctor ˈdɒktə || ˈdɑːktər. The release stage of the first plosive is then usually inaudible (‘masked’). Otherwise, they are unaspirated or just slightly aspirated. For example, ripe raɪp, shut ʃʌt, lake leɪk; happy ˈhæpi, writer ˈraɪtə (BrE), lucky ˈlʌki; wasp wɒsp || wɑːsp, restinɡ ˈrestɪŋ, Oscar ˈɒskə || ˈɑːskər, lifted ˈlɪftɪd, today təˈdeɪ. Peter Roach suggests the useful word potato pəˈteɪtəʊ (BrE). The initial p is unaspirated (because a weak vowel follows). The first t is aspirated (at the beginning of a stressed syllable). The second one is weakly aspirated (at the end of a syllable, I would say; or you could alternatively say because followed by an unstressed vowel). Spanish [p t k] are always unaspirated. They have zero VOT. Another phonological feature sometimes claimed to be involved is [spread glottis]. Aspirated stops and voiceless sonorants are then said to share a common feature of aspiration (or [spread glottis]). 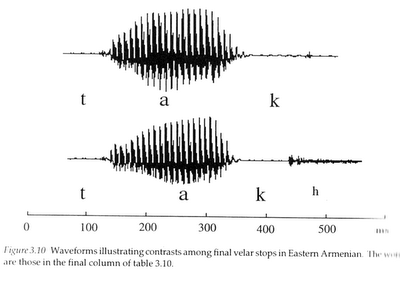 This helps account for the fact that in some languages unaspirated and aspirated voiceless plosives contrast in word-final position (see the waveforms for Armenian final [k] and [kh], taken from Ladefoged and Maddieson’s The Sounds of the World’s Languages). It’s no use talking about VOT there: in sentence-final position both possibilities have trivially infinite VOT (there’s no VOT because there’s no voice onset). One might also like to add that VOT is sensitive to place of articulation. Other things being equal, the VOT of posterior articulations, velar and uvular, are considerably longer, at least for native English speakers, than articulations further forward in the vocal tract. A typical VOT for stressed syllable initial [k] in English is in the region of 120ms, while that for an equivalent [p]is only 60-70ms. I am pretty sure that this difference is an important secondary cue for the perception of place in voiceless plosives and one which, as far as I know, has not been properly investigated. The reason for this difference has a plausible aerodynamic explanation, but I perhaps should not go into this now. The question of place of articulation in conjunction with VOT is an interesting one. At first glance I thought that my final stops in ripe and shut were unreleased, while I do release the /k/ in lake. Upon repeating the words, I found that I do release the /p/ in ripe, though the aspiration is significantly less than in lake. I think as a rule my final t's are never released except for emphasis. Ryan, it is the case with many other native speakers: unreleased /t/ when syllable-final; /p/ and /k/ are kinda released. I observe this when I hear when my chinese collegue pronounces words that end with /p/ and /k/, which doesn't sound native. David Kahn in his "Syllable based generalizations in English Phonology" notes what you observed in your speech.